Are you effectively managing your online reputation? In this article, we look at a simple yet effective tool for WordPress users that lets you legally and ethically manage customer reviews. 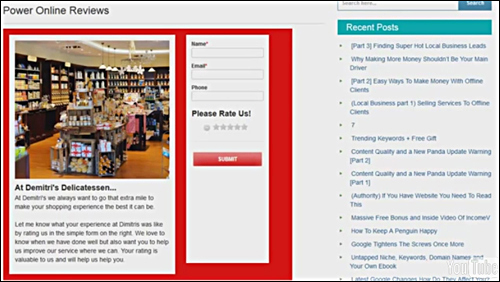 Power Online Reviews is a simple to install WordPress plugin that 3rd-party review sites, and give your business a significant revenue boost. 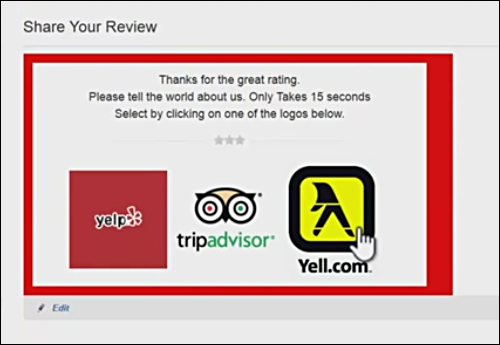 Power Online Reviews will ensure that positive reviewers are prompted to add reviews to third-party review sites like Yelp, Trip Advisor, Google Plus etc. 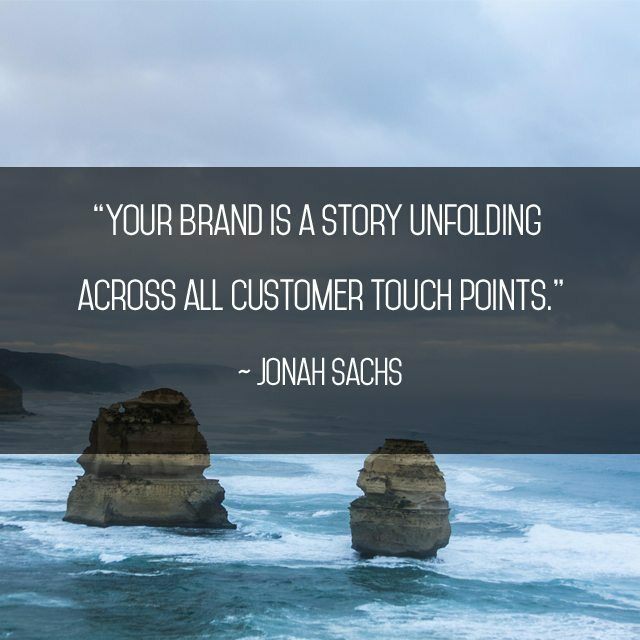 Negative user experiences are filtered on the website for attention by the business owner. 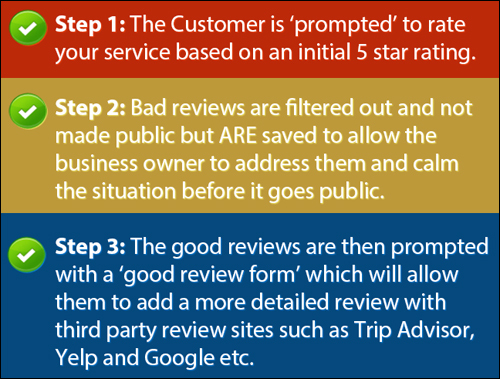 This simple screening process can help to ensure the submission of more positive 3rd-party reviews and happier customers where the service may have been below standard. 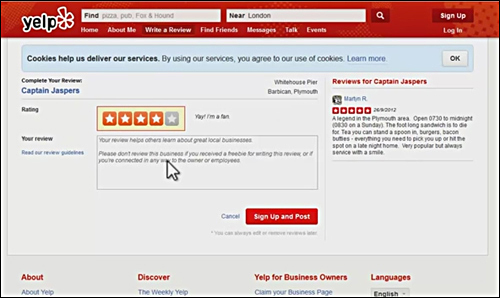 According to a recent study by Harvard Business School professor Michael Luca, “a one-star increase in Yelp ratings leads to a 5-9% increase in revenue for the business”. The plugin automatically generates a review form for your site upon installation and activation. The form is very simple for visitors and customers to fill in. 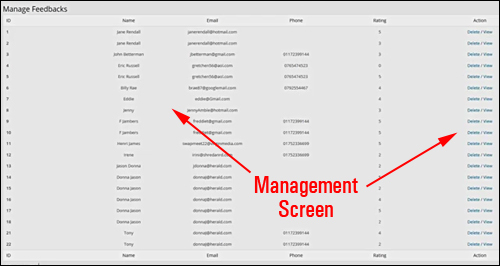 Users enter their name and email address (phone number is optional). 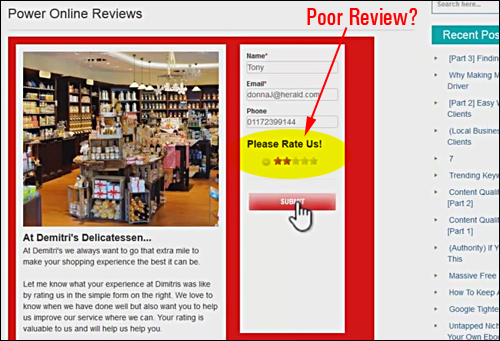 Users are then asked to provide a rating of your products. 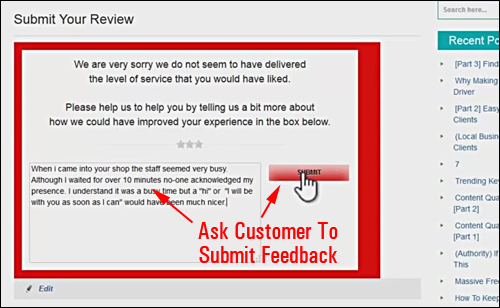 What Happens When Customers Leave Good Feedback? When users leave a negative rating (e.g. “1”), they are not sent to third-party review sites. Instead, the reviews are saved in your website, giving you the option to contact the customer and also avoiding them venting or posting negative comments on Facebook, social media sites, or other popular review sites. Power Online Reviews installs just like any regular plugin. Just upload a zip folder containing the plugin files to your Plugins folder via your admin user login and activate. As shown in the previous section, the plugin automatically creates a review form on your site upon installation and activation. All you need to do after that is customize your form settings and you’re good to go. Negative comments can harm your business. Positive reviews can explode revenues. If, for whatever reason, your service has fallen below par, you want to know about it a.s.a.p., so you can repair any damage before things get worse. Repair Existing Damage: If you have any existing negative reviews, you can start to repair the damage by increasing the number of positive reviews flowing to third-party review sites and not allowing bad reviews from growing. Increase Campaigns For Customer Reviews With Confidence: Once you create an effective “net” that filters negative visitor reviews and allows only positive comments about your business to get through, you can confidently begin to increase your campaigns and email requests for feedback about your business on your site. Allows easy collection of customer feedback. User feedback is centrally managed on your website. Ethical management of favorable and poor reviews. 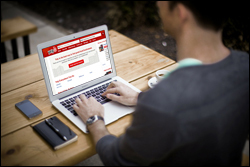 Positive reviewers are automatically prompted to post reviews on third-party review sites. Poor reviews are “quarantined” for the business owner’s attention. 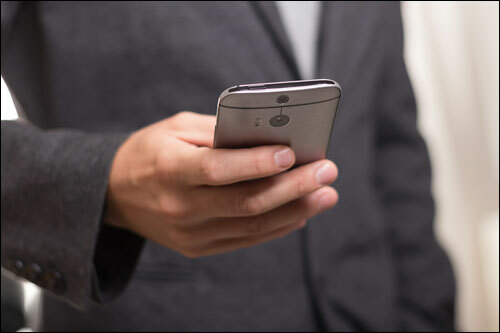 All forms are fully responsive and display correctly on all computers, tablets, and smartphone devices. All forms are instantly generated as soon as you activate the plugin. First Review Form: Display image of business. Add title/prompt and default formatted text. Edit form colour background and border, color of submit button and text. 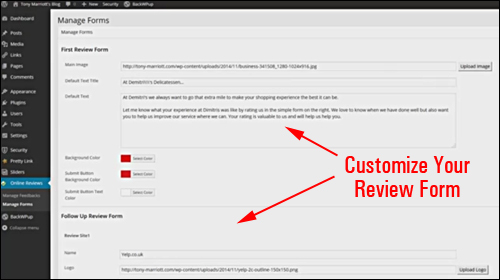 Follow Up Review Form- Add in your third-party review site names (e.g. Yelp, Trip Advisor, Yell.com), logos, user account URLs (i.e. 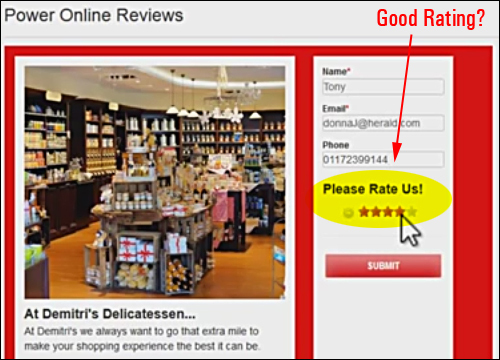 the URLs visitors go to leave a review about your business) and specify whether to display these on your form or not. You can store up to 5 review sites. Ratings Section – Select which rating number or above will be regarded as being a “good” review (e.g. “4”). Everything below the number you set will be categorized as a “bad” review and captured “Manage Feedbacks” screen, so your visitors will not be invited to continue to the 3rd-party review sites). Other customizable features in this section include the submit button background color, and submit button text color. This plugin was developed for WordPress users. If you do not have a WordPress site as your main website, you can still benefit from the plugin by having WordPress installed with the plugin added on a subdomain or subfolder of your domain (e.g. “mydomain.com/feedback”) and linking to this “feedback” section from your main site navigation menus. 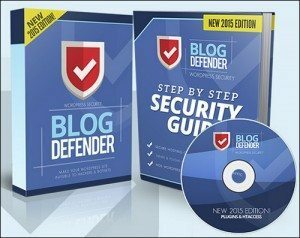 The plugin was developed and is maintained by Tony Marriott, an experienced WordPress plugin and software developer, and is sold with a risk-free, 30 day, complete money-back guarantee. Multi-User – Install the plugin on multiple of your own sites. Price = $29.00. Developer License – Can be installed on all sites that you own. Can be installed on all client sites for payment or part of a paid service. Can sell with site installation (transferring single user license). Price = $37.00. Note: Price details for Power Online Reviews depends on whether there are any promotions or limited-time special offers. When we last checked, the product sells for the prices shown above. This may or may not be the actual pricing set by the plugin seller when you visit the site and there may be additional upsells or one-time offers after your purchase. For “how to” videos of the plugin in action, including installation instructions and tutorials, FAQs, support helpdesk, contact details and more, visit the Power Online Reviews website. Many companies around the world are currently missing out on opportunities to create happier customers and retain existing ones because they are not monitoring their online reputations effectively. This plugin offers a simple, easy and inexpensive solution to begin managing your online reputation.